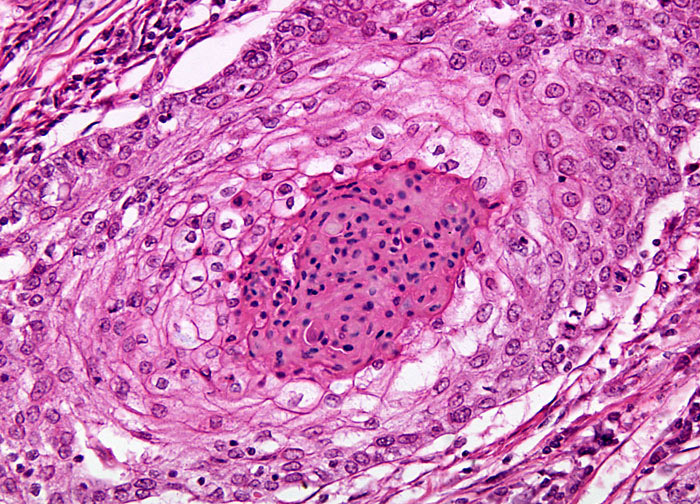 Squamous cell carcinoma is a type of cancer that develops in epithelial tissues. It may occur along the surfaces of a number of different organs, but is most familiar as a disease of the skin. In fact, squamous cell carcinoma accounts for about 20 percent of all non-melanoma skin cancers and is most often attributed to chronic exposure to the ultraviolet radiation of the sun. Individuals with fair skin that tends to burn rather than tan and light-colored eyes and hair are at greatest risk. Occurrence of the disease may also be associated with radiation treatments, scarring from burns, ulceration, adverse reactivity to vaccinations, and exposure to tar and mineral oil. Approximately 200,000 inhabitants of the United States are diagnosed with this type of cancer each year. Most cases arise from solar keratoses, scaly or warty lesions that typically form on the ears, hands, and other parts of the body frequently exposed to the sun, but can also be precluded by white patchy areas or the reddened scaly plaques characteristic of Bowen’s disease.